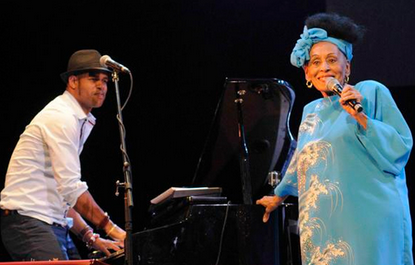 Last Sunday January 18th Omara Portuondo premiered her latest release Magia Negra in her hometwon Havana. Along with young pianist Roberto Fonseca, and special guests EL MICHA and David Blanco, Omara sang the very best of Cuban classics such as Bésame Mucho, Veinte Años and some songs from the album. Click here to see the photo album from that night.